Notes from the round table / reading seminar on the recent debates and (re)interpretations of Soviet social history during the Stalinist era. The discussion was focused on the recent book by Mark Edele: Stalinist Society, 1928-1953 (New York: Oxford University Press, 2011). Keynote speaker: Prof. Lynne Viola. Moderator: Alexandr Voronovici. Participants: the PLURAL Doctoral Seminar and the World History Department members. The round table took place at the Department of World History, Moldova Pedagogical State University (MPSU), Chisinau, on April 11th. 4.) push for professionalization--sources, etc. 1. question the form of this book--an essay? a textbook? 2. he is also able to analyze historiographical developments within the larger context of the development of history as a discipline, looking at influences from other national areas as well as looking at the growing pains of a field as it pulled away from its government minders. "In my opinion, Mark Edele's book is an interesting attempt to frame, what he calls, the “neo-totalitarian political economy of Stalinism”. At the same time Edele has also other, additional goals in the book. Thus, he tries to challenge the “modernity school” in the Soviet studies, which in last decade became one of the dominant schools in the historiography. At the same time he aims to resurrect the economic history of the Soviet Union, written in a simple and comprehensible manner. Following these goals, Edele is also trying to create a new interpretation for the analysis of the Stalinist society, which should go beyond the existing historiographical clashes and struggles in the Soviet studies. Nevertheless, as the last chapter of the book suggests his views, positions, and attitudes are still deeply embedded in and influenced by the existing historiography of the Soviet Union and its politics. Edele's arguments are also weakened by his inconsequent and ambiguous use of many key terms and concepts. For instance, his use and understanding of the concepts “totalitarianism” or “neo-totalitarian” is not always clear. Mostly, it looks like for Edele the “(neo-)totalitarian” character of the Soviet Union under Stalin boils down to the use of terror and violence. Yet, this is a rather simplistic and one-sided use of the concept. Similarly, Edele's understanding of “Stalinist” and “Stalinism” remains ambiguous. It remains unclear whether Mark Edele uses the terms only in chronological sense, just as the shortcut for the Soviet society under Stalin, or he attributes some qualitative characteristics to them. Despite certain shortcomings Edele's book is an engaging and useful reading for anybody interested in Soviet history. It is written in a relatively easy and comprehensible language. 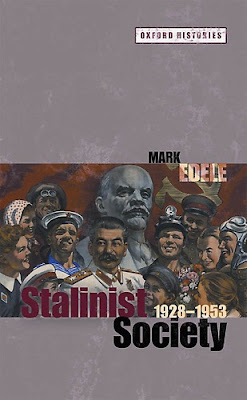 Very possibly, while writing the book, Edele viewed as one of his main target groups undergraduate and graduate students, whom he aimed to “convert” to his interpretation of the Stalinist society. At the same time Edele's book would be also an interesting and provocative reading for the specialists, who may find the author's arguments and readings of the historiography of use for their research and teaching." “In the Stalinist Society, 1928-1953, M. Edele purposely simplifies the history of USSR in the Stalinist era. Edele’s book proposes a synthesis of the current historical debate on Stalinism. The author is ambitious in his scope, but modest in the form of his writing: as Edele points out in the introduction, the book is rather a historical essay, than a classical scholarly monograph. While reading this book, I hoped that it will succeed to overcome the antagonistic paradigms (‘totalitarianism’ vs. ‘revisionism’) of the Soviet history, as well as the usual biases and binary concepts (e.g. state vs. society, victims vs. perpetrators, etc.) related to the study of the USSR. Indeed, Edele tries to do so, at least until the last chapter, where he overtly expresses his sympathies, antipathies and scholarly allegiances. As Lynne Viola said earlier (in this discussion), Stephen Kotkin could not make his scholarly work without Sheila Fitzpatrick’s contribution. We can add that Fitzpatrick herself could not write her books without the contribution of the first historians of the USSR, the so-called ‘totalitarians’. The debate and the polemics are intrinsic features of the academic life, all the more in historical milieus. However, sometimes, when exacerbated by ideological and political adhesions, the polemics biases the academic / historical communication, instead of stimulating the discussion and exchange of ideas. Thus, it is also needed to go beyond the polemical dimension of the academic / historical writing, by reconciling the traditionally opposite paradigms. In the first chapter (“Stalinist life”), Edele uses the socio-biographical approach, in order to go deeper into the ‘Soviet society’, through the life story of a specific individual. By shedding light over the contradictions and the shadows of a particular life experience, in the context of an epoch of tremendous changes (the “Revolutions from above”), the author attempts to de-reify the ‘Stalinist society’ itself.